Ellie turned 4 this year. Whew, Four! Already. Such a strange age she has so much independence in so many ways but I still see my “wee one” in between those burst of growing up. All the “No! I want to do its” and then the “Mommy I can’t I need your help” mixed into one little girl. If I took a snapshot of my little girl right now I think I would find quiet a few of these contradictions. She is fancy. She loves all things princess, dressing up, fixing her hair, all that. She is very particular about what she wears and most of the time it has to be a dress but on the flip side of that she loves bugs, rolly-pollies are her bug of choice these days, but anything that crawls and creeps has her interest. She and Owen have been catching flies at our back door lately trapping them in my Tupperware. We had a couple of pet caterpillars off of a tree in our yard for a day or two and when I picked her up from school one day last week she had a moth in her pocket she had found during outside time. She is full of heart and is genuinely concerned when someone is sad or hurt, but can turn on her brother and push him away with her foot to his face. She has a reserved shy side to her, but can make friends easily and accepts everyone. 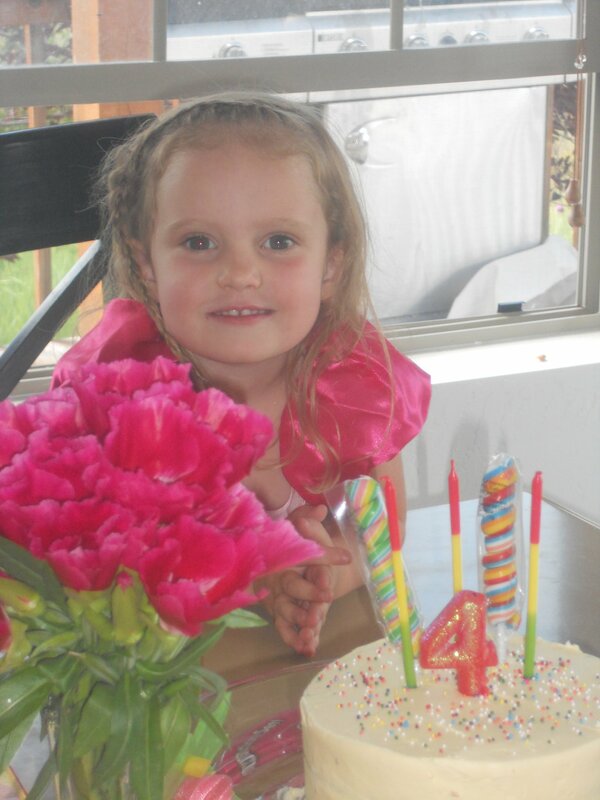 She is 4 now and we are so in love with this “wee one”. 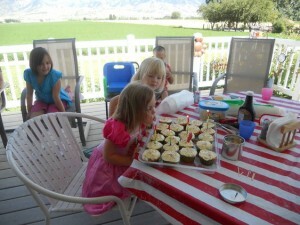 She had a good Birthday we traveled up to my parents a few days prior to have a little party with them and the cousins. Mom and Dad had just barely moved Great Grandpa in so we kept it low key and mellow. Ellie was excited to see Grandma and Grandpa and play with her cousins that’s all she really needed. 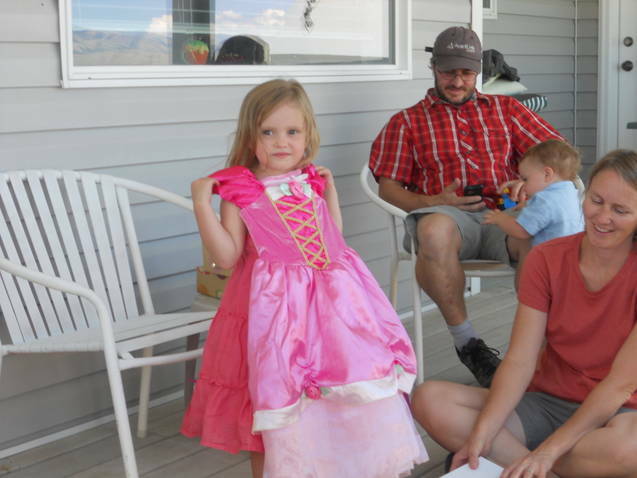 Grandma surprised her with a beautiful princess dress. A few days later on her actual birthday we invited Ellie’s best friend Zak over for an all day play date. Our neighbor had given us a bounce house. It has been passed through the neighborhood for a few years and isn’t the bounce house it once was but it held enough air for Zak and Ellie to go crazy in. 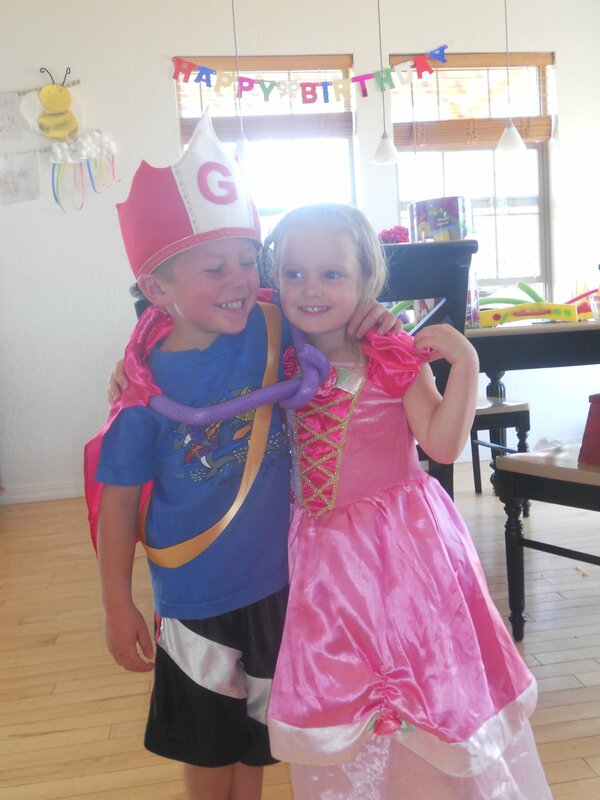 Ellie wore her princess dress and insisted Zak wear Gary’s birthday crown and I fashioned him a little gold sash. They were very cute little royalty for a day. I took Ellie to get her hair cut in the morning. On the way home she said “Mommy it’s like Zak and I are getting married”. “Oh! hold your horses” I replied. She watched her aunt Sarah get her hair done one beautiful morning in July and then Aunt Sarah got married so that is what she was equating it to and it was so entirely sweet I wanted to laugh and cry at the same time. See what I mean about being so independent and yet so innocent still. I love it. We are in love w/ her spirit too. She makes us laugh. We love to see her independence come out yet she is so shy. It is great to be a princess and a bug scientist at the same time! We love you Ellie have a great year! Oh what a beautiful post. Got me all choked up! Ellie is the sweetest thing. For such a wee one, she opens her heart and her excitement to every little thing presented to her. We can see why Mommy, Daddy and Owen enjoys her so much. 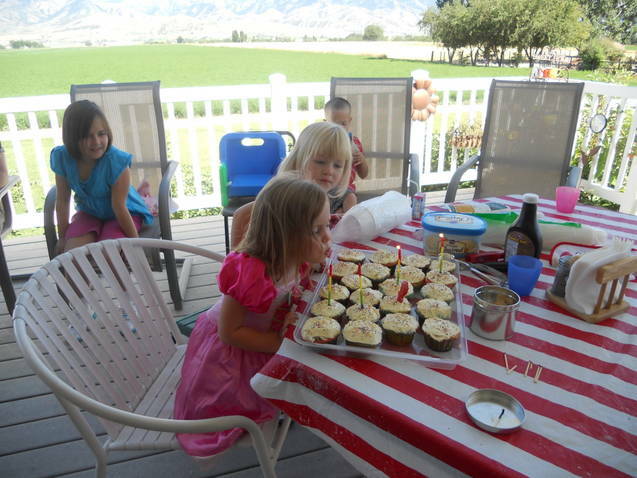 Hard to believe she is 4 years old. Seems like yesterday, she was in her backpack:) We love you Ellen Opal!!! 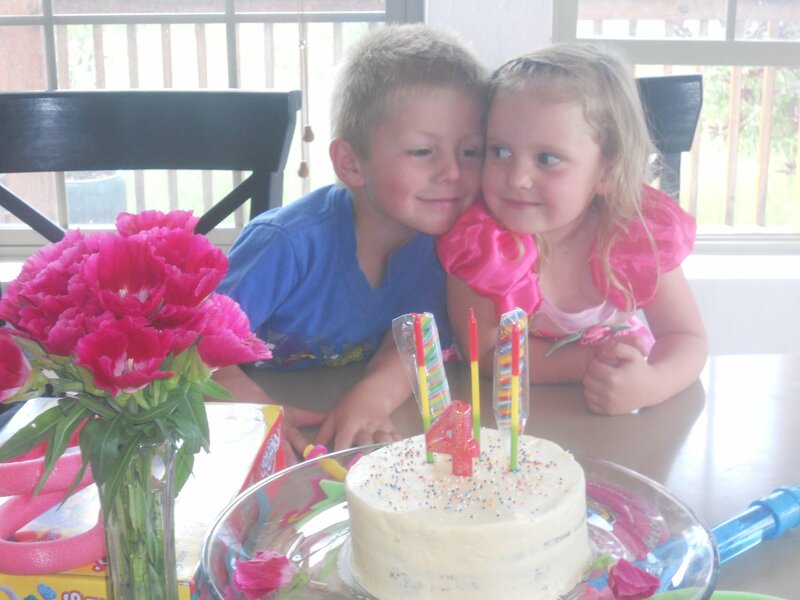 Happy 4th Birthday!